There are two dishes that are staples at Armenian households, one of which is macaron. No, no, don’t get excited. I don’t mean the delicate French almond meringue sandwich cookies. Our macaron is a pasta concoction made with seasoned ground beef in a tomato sauce steamed slowly over a bed of potato slices. I know, #omg, right? More on that later. Today’s let’s talk about the other one, Garmir Pilaf, which literally means red rice in Armenian.This fluffy tomato-stained rice is one that Mom makes best and I could happily eat it every night for dinner. It is such a simple dish, really, but it’s so comforting, easily qualifies as a craving. Making delightfully fluffy red rice is something of an art, because that the rice:water ratio is often miscalculated, resulting in very shloppy rice (or a brick, as Shawn says), which is not a problem if you love risotto. We Middle Easterners revel in the fluffiness of our rice. It’s a talent, a skill, maybe even a divine gift. Usually making fluffy rice isn’t a problem, but for Red Rice, this can be a bit of a challenge. The water content of the tomatoes offsets the moisture balance in the rice. So, it’s best to treat the tomatoes like water and measure them. You can always add more water if needed, but you can’t undo shloppy rice. This is not a difficult dish to make. The only difficult part is waiting for the rice to be ready for eating! When I was a kid, I’d visit friends for play dates and stay for lunch. There were the usual favorites and Red Rice often made an appearance on the table. As a child, I thought the recipe was common knowledge, but it wasn’t until I had my first bite that I was a bit disappointed. It never tasted as good as when my mom made it. Luckily, Mom shared her recipe with me years ago, even training me during cooking classes in her kitchen on Saturdays. I followed her instructions, but could never quite get the taste right. I experimented with various spices, even balsamic vinegar at some point. The worchestershire sauce is my addition and made quite a difference, but it wasn’t until recently when Mom took over cooking that I saw the secret ingredient. I grabbed a jar of Persian pickled vegetables from the fridge and as I headed to the table, she stopped me and asked for the jar. Then she slid the cap off, carefully poured a bit of the pickle juice into her pot and sent me on my way. My jaw must’ve hit the floor, because I would never, EVER have seen that one coming. Now, we know. My mom always says my hand is delicious, but that I rush things too much. The foundation of cooking from our homeland is always slow-fried onions. This simple step actually requires a lot of patience and is often my failing point. If I turn up the heat, because it’s simply taking too long for the onions to fry, I often walk away from the stove to do something else (fold laundry) and end up burning the onions. If I keep the flames on the lowest setting, I often walk away from the stove to do something else (fold laundry), I take longer to check on them and end up burning the onions. The full-proof method to guaranteed perfectly fried onions is staying put, staring at the pan, gently moving them around to ensure even browning. This step bores me to no end and, so, is my biggest challenge in cooking Middle Eastern fare. 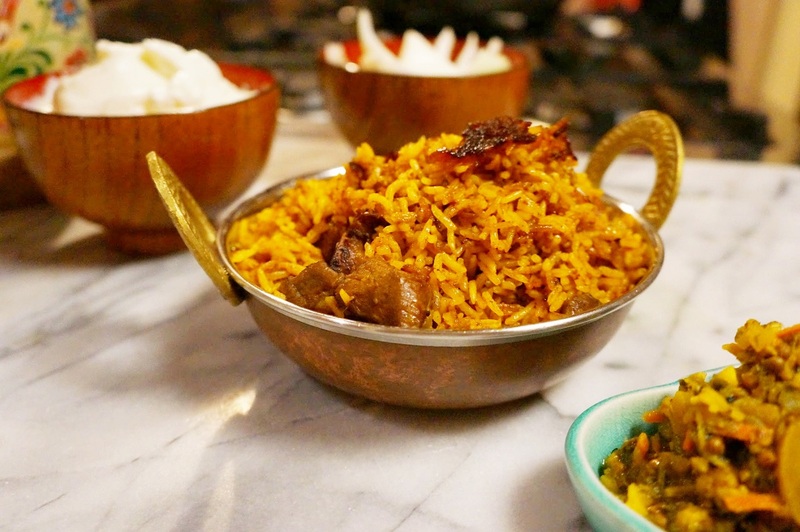 If you are patient by nature, you have already mastered the fundamental skill required to successfully making Persian food. Trim and cut meat into 1/2-inch cubes. Collect in a deep pot and fill with enough cold water to just cover the meat, ~ 3 cups. Put the lid on and set the pot over medium-high heat. Periodically skim the froth from the top of the water. Meanwhile, crush and mince garlic. Set aside. Drizzle olive oil into a pan and set over medium-high heat. Keep an eye on the onions as they tend to take forever to change color, but burn suddenly. Add garlic and continue to cook another 2-3 mins. Remove beef from the pot, but reserve the broth. Add meat to the pan with the onion and garlic. Sprinkle turmeric and fry another 3 mins or so. Measure 3 cups of the broth. If there isn’t enough broth to make 3 cups, supplement with water. Return 3 cups of liquid back to the pot. Add meat, onion, garlic, rice, tomatoes, Worcestershire sauce, lemon and pickle juices, season to taste. Give it a gentle stir or two. Place a clean tea towel over the pot, then top with the lid. Tie the ends of the tea towel over the pot lid. Light burner to a low flame and let the rice steam for 45-50 mins. Serve with a fresh onions, salad, yogurt and pickled vegetables. The best things in life are simple. Last night was Daisy’s birthday. When I asked her what she wanted for dinner, the answer was Garmir Pilaf. It’s always Garmir Pilaf (or chicken nuggets from “Old McDonald’s,” but I pretend I don’t hear those words come out of my sweet, beautiful child’s mouth.) Red Rice is simple, rustic, comforting. There’s nothing about it that anyone could dislike, if made correctly. As simple as this dish is, making it can be tricky. Let’s say you don’t have tomato paste and so you want to use fresh tomatoes. That could spell disaster, if you don’t account for the added moisture in fresh tomatoes. Then, there’s the question of just how many fresh tomatoes are you going to toss into the pot? Water is your enemy, if you’re bad at math. As long as you maintain the 1 part liquid to 2 parts rice ratio, your Red Rice will be a success. Don’t be afraid to mix things up a bit. Some people add slices of fresh green beans to the mix. Skip the steak and toss in slices of hot dogs. My grandma used to do this for us sometimes. This is a classic from my childhood, a rustic dish of fluffy rice infused with tomatoes that will soon be your favorite, too. Simple start to a delicious end. This recipe sounds very tasty. Thanks for sharing. Please try it and let me know how you like it. Love that secret ingredient, even more special after trying a variety of ways yourself. Happy feasting…happy keeping up with traditional dishes. Thanks!Hope you try it and love it as much as we do. Keep me posted! Today made your pilaf, it was gooood! But I have a question: in the ingredients section there is juice of one lemon component. On what stage it should be added to pilaf? I’m so happy to hear that, Luba! You add the juice when you toss everything into the pot along with the rice. I can easily see how this could be something you’d want to eat every day! Again, such flavors!